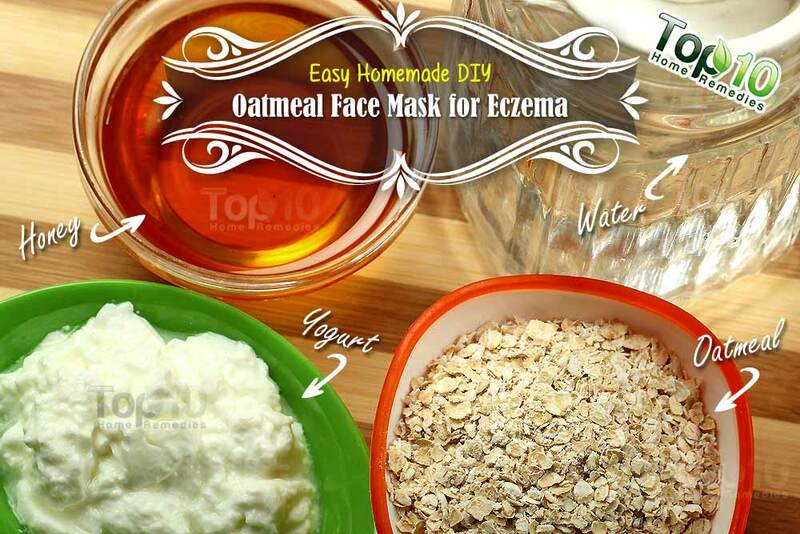 Soothe your eczema and calm your angry skin with this easy oatmeal, honey and yogurt mask. You can use it on your face and body, and it is suitable for all skin types. 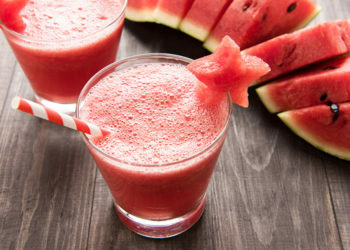 The ingredients in this recipe will pamper and moisturize your skin. Plus, it will rejuvenate the skin and deep clean the pores. 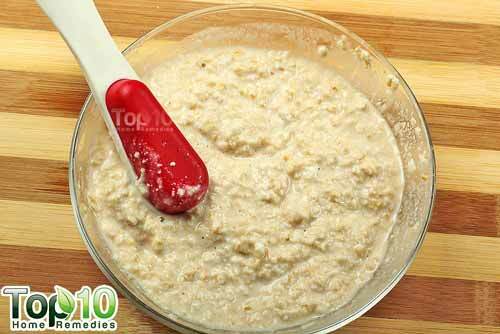 Oatmeal’s anti-inflammatory properties are excellent for soothing irritation and itching caused by eczema. As it reduces inflammation and absorbs excess oil, it is also good for acne breakouts. Interestingly, the saponins in oatmeal allow it to work as a natural cleanser and remove dirt and dead skin from your pores. It has a sunburn-fighting effect as well. Honey and yogurt will also soothe your skin. Both contain nutrients that help maintain soft and smooth skin. Honey, being a natural humectant and anti-inflammatory, helps retain moisture in the skin and reduces inflammation. 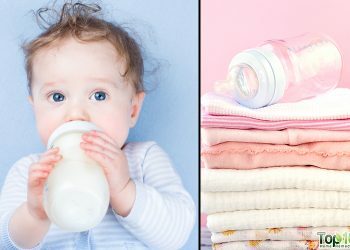 Plus, it has antimicrobial properties that help fight bacteria and prevent infection. Yogurt contains lactic acid that works as a mild exfoliant to remove rough, dead skin. 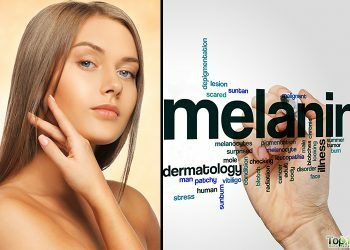 Also, its bleaching properties help clear blemishes and dark spots from the skin. 1. 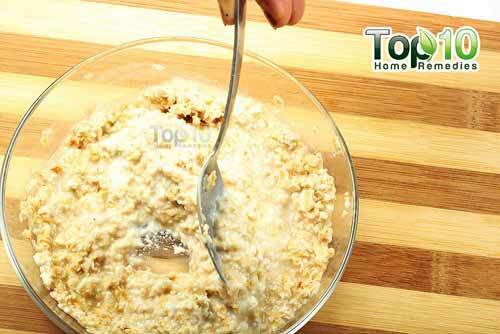 Put 1/3 cup of oatmeal in a bowl. 2. Pour in 1/2 cup of hot water and let it sit for a few minutes. 3. 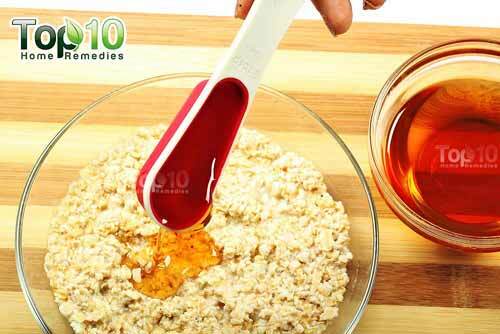 Add 1 tablespoon of honey to it. 4. 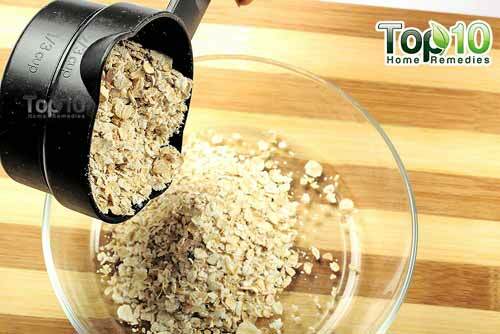 Add 1 to 2 tablespoons of plain yogurt. You can now use your own soothing oatmeal mask on your skin. Slather the oatmeal mask on your skin. Remove the mask using a soft, damp cloth or tissue. Rinse your skin with warm water. 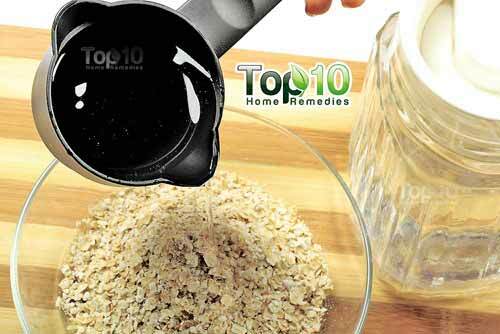 Use this homemade oatmeal mask on inflamed skin once a day, as needed. On acne-prone skin, you can use it once or twice a week. Remove all makeup before applying this or any other mask on your skin. Make sure to use plain oatmeal, not flavored varieties that contain artificial flavors and colors that may irritate the skin. The same is true for yogurt. Use raw, organic honey in this recipe. For treating dry skin, you can replace the honey with a mashed avocado. To tame angry skin and treat eczema, you can also take an oatmeal bath. 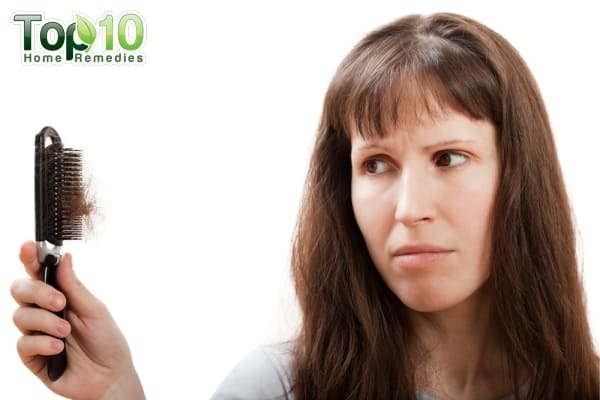 Keeping your skin moisturized is extremely important when dealing with eczema and dry skin. Make it a habit to coat your skin with organic virgin coconut oil after taking a bath or shower to lock in the moisture. How long is the face mask good for or for how many uses? 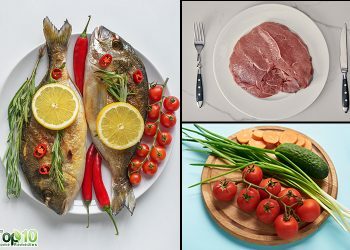 As the when all ingredients are combined, it ends up making an awful lot that you would hardly put the whole lot on at one time?